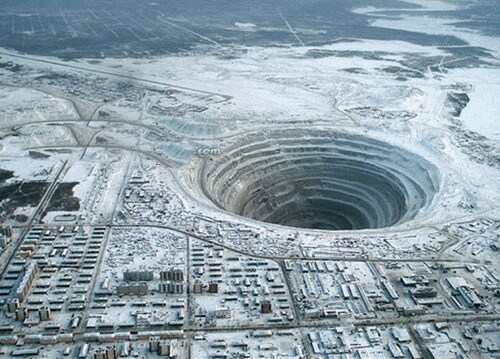 The Mir mine was the first and the largest diamond mine in the Soviet Union. Its surface operation lasted 44 years, finally closing in June 2001. 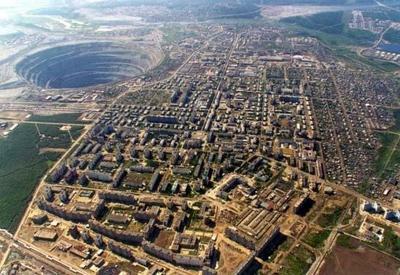 After the collapse of the USSR in the 1990s, the mine was operated by the Sakha diamond company, which reported annual profits in excess of $600 million from diamond sales. Currently, the mine is operated by Alrosa, the largest diamond producing company in Russia, and employs 3,600 workers. It had long been anticipated that the recovery of diamonds by conventional surface methods would saturate. Thus, in the 1970s, construction has started on a network of underground tunnels for diamond recovery. Production of diamonds by this method started in 1999 and is estimated to last for another 27 years. This estimate is based on depth explorations down to 1,220 meters. In order to stabilize the abandoned main pit, its bottom was covered by a rubble layer 45 meters thick.